At the cutting edge of sewing technology, Janome sewing machines deliver the precise, professional results that every sewer strives to attain. The company’s unwavering goal of manufacturing high quality machines that inspire creativity and innovation yet are simple to use, stems from the belief that the better your tools, the more artistic, inventive and pleasurable your sewing experience will be. 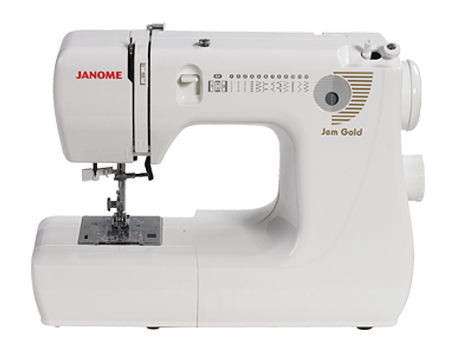 Designed for performance, quality, comfort and instinctive ease of operation, Janome sewing machines are a favorite amongst skilled veterans and enthusiastic beginners alike. The Popular Line: Great for beginners and occasional sewers, these machines are reasonably priced and come with plenty of basic features make these machines. Some models in this range have built-in stitches and a buttonhole feature. The Mid Line: The machines in this range are more versatile and offer more advanced features. The introductory models of the QC (Quilter’s Companion) series are included in this range. All of the QC models come with a quilting foot set and a large extension table. Computerized Line: The fully computerized sewing machines in this range come loaded with more complex features including preprogrammed stitches and multiple styles of automatic buttonholes. Janome’s Memory Craft models, which are included in this line, range from basic to top-range models with state of the art features including a moving screen. Overlocker Line: For anyone looking for a professional look to all their sewing work, there are three reasonably priced overlocker models to choose from.